Spring is in full swing and we can't wait to share some of our favorite tablescapes for Easter! We are currently loving the idea of "less is more," and have found some simple yet elegant options that would be easy to recreate. 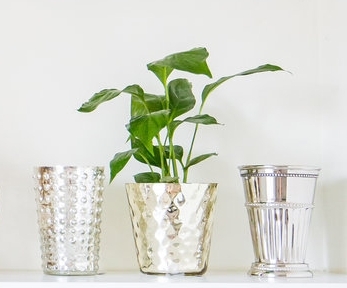 If you are getting ready for a big Easter celebration this weekend or any fun family event this spring, we hope you find some inspiration here! Hydrangeas are always our favorite, and this darling tablescape from Small Wood Home really caught our eye. 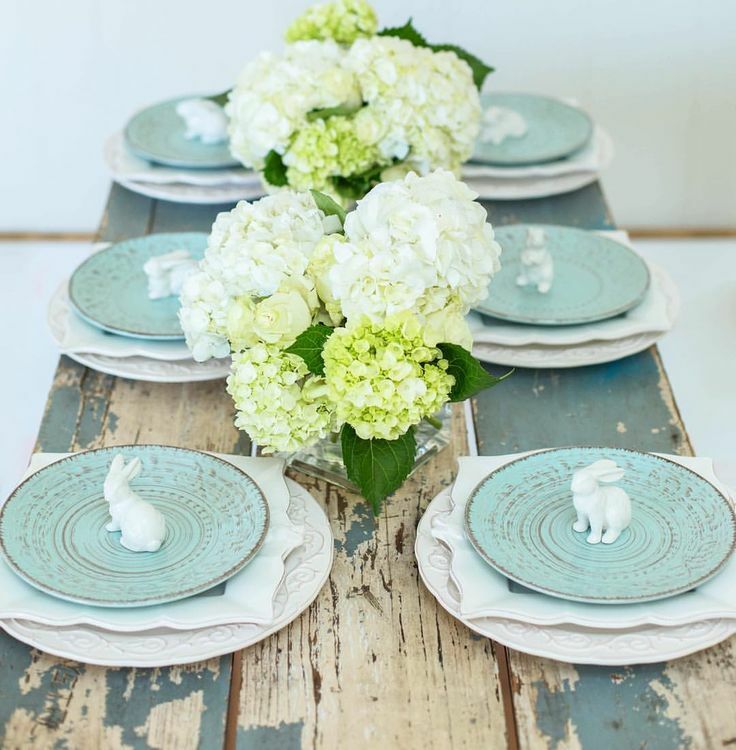 You can never go wrong with fresh flowers as a centerpiece, and the layered blue and white dishes topped with a sweet porcelain bunny are perfect for spring! Pink is always prominent in the spring, and we love this combination of blue glass with pink blooms. This simple centerpiece really adds a pop of color against the soft white table runner and place mats. And not to be overlooked are the fabulous speckled paper mache eggs, which we think add the perfect touch! Colorful farm fresh eggs have a dual purpose here and create a beautiful Easter centerpiece paired with some of the happiest daffodils we've ever seen. We love the simple white linens topped with a single flower and the simplicity of each table setting. You all know we've been loving blue, and this pretty place setting is no exception. The woven charger is the perfect base to the blue and white dishes, and the blue linen tied with a fun decorative tag creates just the right look for a simple Easter table. Keeping everything neutral is never a bad thing, but for spring adding a pop of color is always nice! 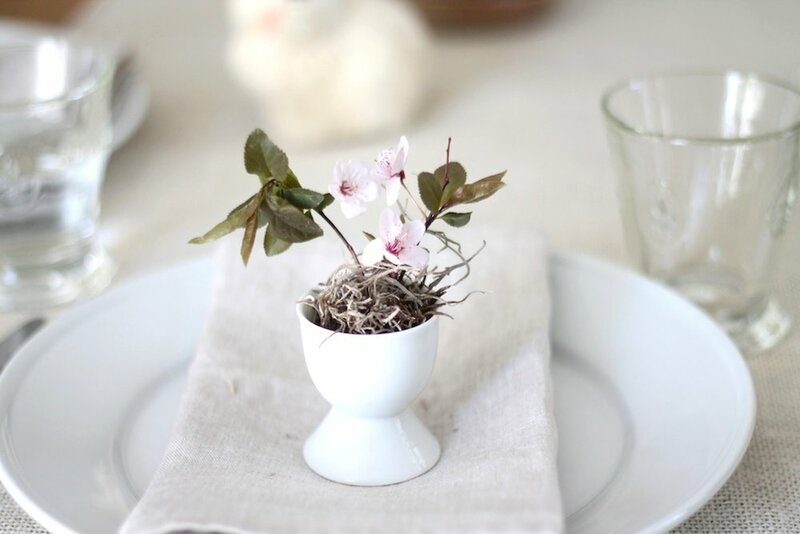 This single cherry blossom is sweet and simple, and it looks absolutely darling in this classic porcelain egg cup, adding just the right hint of pink. And finally, these little birds' nests are always fun, and filling them with chocolate eggs make them the perfect spring detail that doubles as a sweet treat. Now, to wrap things up, our best suggestion when it comes to putting together your spring tablescapes is to take advantage of all things fresh. When using fresh flowers, grasses, sprigs, and branches, you can never go wrong!